We create life-like prosthetics with the latest technology and an artist's touch. The very qualities that guided us to the field, keep us ahead of it today. Prosthetic Art Technology provides high quality prosthetic rehabilitation. We specialise in restoration of the face and body. Our prostheses are one-of-a-kind, tailored for each individual with the utmost care. Our custom crafted prostheses restore human anatomy and help reshape lives. We pay great attention to perfecting every detail, from skin tone to eyelash, right down to the nearest freckle. Learn about facial prosthetics and how they are made in this video by Beyond Five. Ron shares his experience about getting a facial prosthesis after losing his nose from head and neck cancer. Our anaplastology clinics provide life-like prosthetic rehabilitation for the face and some parts of the body. These types of prostheses are custom made appliances designed to restore a missing or malformed external part of the body that cannot be reconstructed or repaired surgically. Our aim is to provide person-centered, aesthetically excellent and clinically sound prostheses. We enjoy a multidisciplinary team approach to give prosthetic outcomes that are tailored to each person’s anatomy and goals. A main focal point of the face, we sensitively and carefully reconstruct the nose following trauma or illness using soft medical grade silicone. A prosthetic nose keeps delicate sinus tissues moist and allows for normal breathing. Our prostheses are engineered for the individual - each face is unique and so to are our prostheses. A partial or hemi-face includes one or more facial features and is designed to blend as seamlessly as possible into the surrounding skin and anatomy. Our eyes don't blink or move but they do appear to follow you! An orbital prostheses replaces the eye and surrounding tissues following orbital exenteration or trauma. A well placed eye, with lids sculpted and coloured to match the surrounding skin can replicate the opposing eye down to the eyelash. 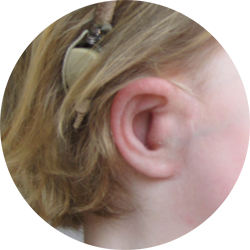 Ear prostheses are often prescribed to patients with Microtia or congenital difference, or after traumatic loss of an ear. We offer various attachment methods based on individual needs and lifestyle. We supply these types of prostheses in collaboration with limb prosthetic company Northern Prosthetics. Get in touch to ask us how.